DWG2ImageX, a Control Component allow you to convert DWG/DXF/DWF file into GIF, JPEG, BMP, PNG directly, without need of AutoCAD. Convert DWG, DXF and DWF file to Image file. You may add font path and xref path. You may set image resolution and iamge paper size. Support AutoCAD drawing in versions from R9 to 2018. 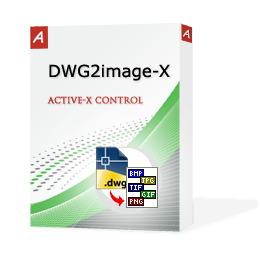 This full featured DWG to image ActiveX Control is a completely standalone utility, don't require any products from AutoDesk to use this converter. DPI is simply the “Dots Per Inch” in your image. That simply means it’s the measure of the resolution of your image based on the number of pixels or printer dots per inch. The density of these dots is called the "resolution." It is the Output Resolution (Image Quality) that determines whether an image is fine or grainy in appearance. The larger the value, the finer the image. Smaller values are more granular. You must run "regsvr32 DWG2ImageX.dll" to register the control first. The DWG to Image Control Component is licensed as DEVELOPER LICENSE, SERVER LICENSE and SITE LICENSE. DWG2ImageX is a Control Component lets you convert DWG/DXF/DWF file into GIF, JPEG, BMP, PNG directly. Please go to the program folder and double click the file reg.bat to register the DWG2ImageX.dll or DWG2ImageX64.dll on your system. If you are running Win7/Win8 and the reg.bat file won't work, please click start button>>All programs>>Accessories, then find the "Command Prompt" and right click it to choose "Run as Administrator" option to open the command prompt window, then try to use the command regsvr32 to register the DWG2ImageX.dll or DWG2ImageX64.dll. Prior try out the active-x program with your own application, please try to give it a very first test with the example code enclosed within the free trial package, please make sure it will work as expected and then try out with your own program. Get the view counts in the dwg file. Get the view name by index. View name or view index. Set pen width ( line width) in pixels, default value is 1. Where AutoCAD font file located. Convert the drawing file to image. objImage.InputFile = "c:\My Drawings\8th floor furniture.dwg"
MsgBox objImage.Version 'Get the drawing file version. MsgBox "Total "& objImage.ViewCount &" Views"
MsgBox "Converting view: "& strViewName& "..."